we have a Thyroid Yoga retreat with Fern coming right up! “The ritual of self-care is self-love; it is romancing yourself. Feeling lonely, sad, or disconnected? Self-care is the answer. Maybe you’re feeling frustrated at your body and the ways she is holding you back from doing all you want to do in life? Self-care is the answer. Tired and lacking in energy? Self-care is the answer. Self-care is exponential. The more you take the time to show yourself and your body some love, the more your body will show you love back. A thank you. She is not ignorant or deceitful. Nor is she devious and purposely trying to slow you down with her cries. All she needs is a pause…and some love, and guess what, self-care is an incredible act of love. Connecting back into my body through these rituals is what helps me tap into my body’s intuition, so I can listen to the whispers before they turn into yelps. The thyroid and the skin are intrinsically connected. Hormonal issues can commonly manifest as issues such as pimples around the mouth and chin area, dry or snake-like skin, or excessively oily complexions. Dry skin, in particular, is a common symptom of an underactive and overwhelmed thyroid, which often manifests as a hypothyroid condition and Hashimoto’s disease. Self-care rituals are magic, and a key component to my Thyroid Yoga course. Routines and practices so seemingly small and simple have yielded profound healing in my life. This is because the magic lies in the intention of these acts. Use these beauty rituals to create an expansiveness in your life. This may sound a little lofty but it is the truth. Taking the time to tend to your own garden expands your ability to serve from spirit. It breaks through any illusioned realities of linear time, namely thinking that you don’t have the time for self-care, and gets you out of your head and into your body. It makes you, the real you, more available. Please don’t try to convince yourself otherwise. You are worth it. You are worthy. THYROID BEAUTY RITUALS FOR SELF-LOVE AND SELF-WORTH. Morning face massage with jade roller and + a botanical avocado and honey face mask recipe, for radiant skin. Massaging the face and neck in the morning is an excellent way to de-puff and clear any fluid congestion that may have built up overnight. 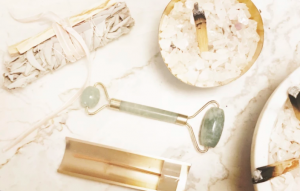 A jade roller is the ultimate holistic answer to lymphatic drainage for the face. The magic lies within the semi-precious stone jade itself, since jade remains cold while in contact with the skin; allowing the pores to close and tighten. Jade also naturally emits infrared rays, which warm and increase blood circulation and thin the lymph, the layer of fluid beneath the skin’s surface. The physical movement and pressure on the skin also gets the lymph moving and thus, a smooth, serene-looking complexion for yourself. Apply a few drops of Radiance Hair, Body, and Face Oil to the face and massage in gently. Next apply a soothing and hydrating face mask: Smash up a quarter of a ripe avocado with a blob of raw honey and add a few extra drops of coconut and geranium oil for an uplifting, energizing fragrance. Nightly restorative yoga pose with aromatherapy self-massage ritual to soothe and cool busy brains. The Supported Bridge yoga pose relieves tension from anxiety, rests your heart, cools and soothes your busy brain, gives you a gentle abdominal stretch, and expands your chest. It is also a great way to counter the effects of a day spent in a chair, or sitting in traffic, and stimulates the balance of the thyroid and parathyroid glands. I recommend that you spend at least three minutes in a supported bridge pose each day. Consider this the highest self-care priority for achieving deep, organic rest. Focus and home in on any areas where you may feel a little tight and in need of some extra TLC. Be intuitive with this process and conscious of every movement of your hands. Being present with this self-care ritual opens you up to receive the love. Take as long as you need; this is time for you to meet and greet your body, after what may have been a full day caught up in the constant distraction of our minds. Then, lie on the floor and rest on your back with your knees bent and thighs parallel to each other. Press your feet into the floor and lift your hips up, slipping a block underneath your sacrum. Place your feet onto your bed or chair to lift your hips up even higher, sliding a second block under your sacrum. Once you have found your sweet spot, extend your legs and feel the space you are creating around your digestive organs, lungs, heart, and throat. Rest your arms alongside your body rolling your upper arms to face the ceiling, palms faced up. Hold that position and feel the sweetness wash over you. The more frequently you integrate these gifts of self-care into your morning and nightly routines, the more you will visibly see and feel your skin sweetly soften, and the beauty and effervescence of your life will shine through too. Check out her original blog post and all things Thyroid Yoga here. To get all the goodies that will help you get that ritual going head over to her insanely high-vibe shop, Ajai!